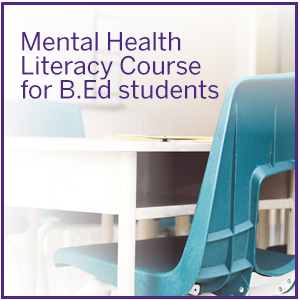 The Mental Health Literacy Course for BEd students at Western University is the first mandatory mental health literacy course in Canada for teacher candidates. The course was first released in September 2016 and is currently in its second iteration. Throughout the 10-week course, teacher candidates navigate various important topics including caring for students, self-care, behavioural and emotional concerns in the classroom, stigma, supporting diversity and promoting inclusion, among others. Through evidence-based school health promotion and research, this course is designed to assist teacher candidates in understanding the development of children, mental health, family dynamics, impact on student learning and well-being and other critical factors including developing and maintaining self-confidence in accessing resources and taking action to support their students. The course further aims to promote equal access to care and is intended to raise teacher awareness of signs that a student may be in need of support through early intervention and prevention. By utilizing evidence-based research including the teacher mental health national curriculum (Kutcher et al., 2013), the aligned and integrated model (AIM; School Mental Health Assist) and a comprehensive curriculum framework (Weston et al., 2008), Dr. Susan Rodger and her team hope to promote the inclusion of mental health literacy in initial teacher education to support teacher candidates with mental health understanding and advocacy not only for their students, families and their schools, but also for themselves.